A supposed power of bewitching or harming by spiteful looks, attributed to certain persons as a natural endowment. 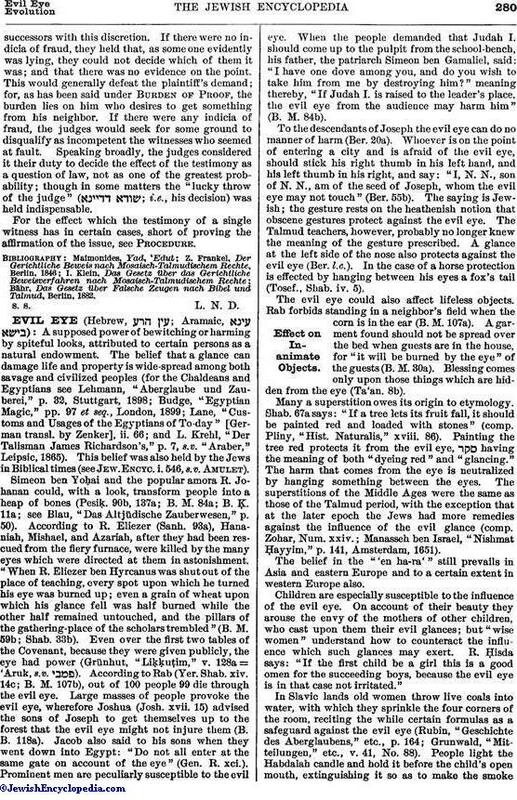 The belief that a glance can damage life and property is wide-spread among both savage and civilized peoples (for the Chaldeans and Egyptians see Lehmann, "Aberglaube und Zauberei," p. 32, Stuttgart, 1898; Budge, "Egyptian Magic," pp. 97 et seq., London, 1899; Lane, "Customs and Usages of the Egyptians of To-day" [German transl. by Zenker], ii. 66; and L. Krehl, "Der Talisman James Richardson's," p. 7, s.v. "Araber," Leipsic, 1865). This belief was also held by the Jews in Biblical times (see Jew. Encyc. i. 546, s.v. Amulet). Simeon ben Yoḥai and the popular amora R. Johanan could, with a look, transform people into a heap of bones (Pesiḳ. 90b, 137a; B. M. 84a; B. Ḳ. 11a; see Blau, "Das Altjüdische Zauberwesen," p. 50). According to R. Eliezer (Sanh. 93a), Hananiah, Mishael, and Azariah, after they had been rescued from the fiery furnace, were killed by the many eyes which were directed at them in astonishment. "When R. Eliezer ben Hyrcanus was shut out of the place of teaching, every spot upon which he turned his eye was burned up; even a grain of wheat upon which his glance fell was half burned while the other half remained untouched, and the pillars of the gathering-place of the scholars trembled" (B. M. 59b; Shab. 33b). Even over the first two tables of the Covenant, because they were given publicly, the eye had power (Grünhut, "Liḳḳuṭim," v. 128a = 'Aruk, s.v. ). According to Rab (Yer. Shab. xiv. 14c; B. M. 107b), out of 100 people 99 die through the evil eye. Large masses of people provoke the evil eye, wherefore Joshua (Josh. xvii. 15) advised the sons of Joseph to get themselves up to the forest that the evil eye might not injure them (B. B. 118a). Jacob also said to his sons when they went down into Egypt: "Do not all enter at the same gate on account of the eye" (Gen. R. xci.). Prominent men are peculiarly susceptible to the evil eye. When the people demanded that Judah I. should come up to the pulpit from the school-bench, his father, the patriarch Simeon ben Gamaliel, said: "I have one dove among you, and do you wish to take him from me by destroying him?" meaning thereby, "If Judah I. is raised to the leader's place, the evil eye from the audience may harm him" (B. M. 84b). To the descendants of Joseph the evil eye can do no manner of harm (Ber. 20a). Whoever is on the point of entering a city and is afraid of the evil eye, should stick his right thumb in his left hand, and his left thumb in his right, and say: "I, N. N., son of N. N., am of the seed of Joseph, whom the evil eye may not touch" (Ber. 55b). The saying is Jewish; the gesture rests on the heathenish notion that obscene gestures protect against the evil eye. The Talmud teachers, however, probably no longer knew the meaning of the gesture prescribed. A glance at the left side of the nose also protects against the evil eye (Ber. l.c.). In the case of a horse protection is effected by hanging between his eyes a fox's tail (Tosef., Shab. iv. 5). The evil eye could also affect lifeless objects. Rab forbids standing in a neighbor's field when the corn is in the ear (B. M. 107a). A garment found should not be spread over the bed when guests are in the house, for "it will be burned by the eye" of the guests (B. M. 30a). Blessing comes only upon those things which are hidden from the eye (Ta'an. 8b). Many a superstition owes its origin to etymology. Shab. 67a says: "If a tree lets its fruit fall, it should be painted red and loaded with stones" (comp. Pliny, "Hist. Naturalis," xviii. 86). Painting the tree red protects it from the evil eye, having the meaning of both "dyeing red" and "glancing." The harm that comes from the eye is neutralized by hanging something between the eyes. 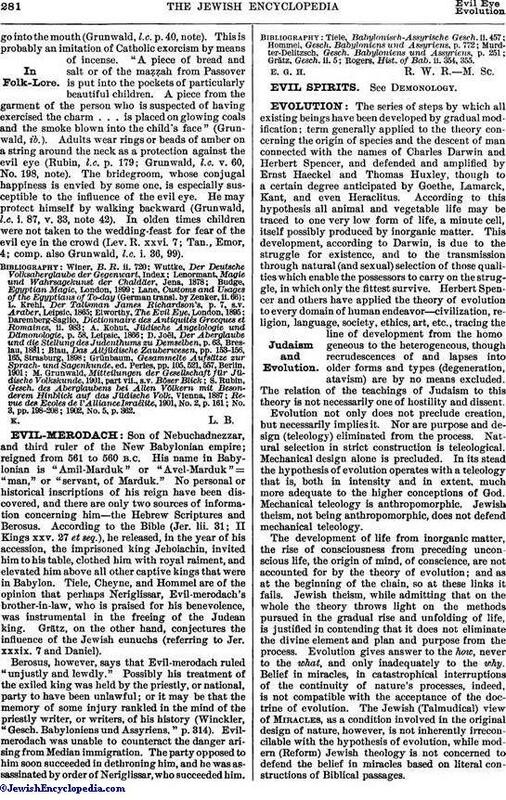 The superstitions of the Middle Ages were the same as those of the Talmud period, with the exception that at the later epoch the Jews had more remedies against the influence of the evil glance (comp. Zohar, Num. xxiv. ; Manasseh ben Israel, "Nishmat Ḥayyim," p. 141, Amsterdam, 1651). The belief in the "'en ha-ra'" still prevails in Asia and eastern Europe and to a certain extent in western Europe also. Children are especially susceptible to the influence of the evil eye. On account of their beauty they arouse the envy of the mothers of other children, who cast upon them their evil glances; but "wise women" understand how to counteract the influence which such glances may exert. R. Ḥisda says: "If the first child be a girl this is a good omen for the succeeding boys, because the evil eye is in that case not irritated." In Slavic lands old women throw live coals into water, with which they sprinkle the four corners of the room, reciting the while certain formulas as a safeguard against the evil eye (Rubin, "Geschichte des Aberglaubens," etc., p. 164; Grunwald, "Mitteilungen," etc., v. 41, No. 88). People light the Habdalah candle and hold it before the child's open mouth, extinguishing it so as to make the smokego into the mouth (Grunwald, l.c. p. 40, note). This is probably an imitation of Catholic exorcism by means of incense. "A piece of bread and salt or of the maẓẓah from Passover is put into the pockets of particularly beautiful children. A piece from the garment of the person who is suspected of having exercised the charm . . . is placed on glowing coals and the smoke blown into the child's face" (Grunwald, ib.). Adults wear rings or beads of amber on a string around the neck as a protection against the evil eye (Rubin, l.c. p. 179; Grunwald, l.c. v. 60, No. 198, note). The bridegroom, whose conjugal happiness is envied by some one, is especially susceptible to the influence of the evil eye. He may protect himself by walking backward (Grunwald, l.c. i. 87, v. 33, note 42). In olden times children were not taken to the wedding-feast for fear of the evil eye in the crowd (Lev. R. xxvi. 7; Tan., Emor, 4; comp. also Grunwald, l.c. i. 36, 99). 1902, No. 5, p. 362.